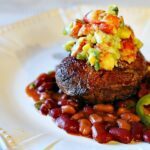 This is a recipe for Pan Seared Filet Mignon topped with a luscious lobster avocado salsa. Could there be a more perfect steak recipe for that special occasion dinner? Pan seared and finished in the oven, this is an easy recipe for cooking filet mignon. I can’t tell you how many times we pan seared filet mignon steaks in Culinary School. It was fast, and an easy way to feed the entire class for lunch. The blazing gas stove burners would be covered with French Steel fry pans, each holding two steaks. At high heat the steaks were seared, turning once and then easily finished in the oven. I appreciate this lavish lunch fare because I’m now fearless when it comes to cooking filet mignon indoors. I’m no longer afraid that I’ll over-cook, under-cook or heaven forbid, burn it to a crisp. And the best take-away is that I’m not afraid of cooking over high heat. As long as I have the correct pan. What’s The Best Pan to Sear Steaks for Stove Top Steak Recipes? This could be a matter of opinion, but the opinion at Culinary School was steadfast about using a French Steel pan. Restaurant chefs use these pans for all kinds of kitchen tasks. They are carbon steel skillets and their strength is in retaining heat. This makes them ideal for searing steaks or crisping chicken skin. And when seasoned correctly, they take on a non-stick quality. Which means you should be able to cook an egg or omelet in them. I’ve only had mine at home for less than a year and haven’t tried cooking an egg yet. I’ll get back to you on that one. For now I’ll keep that non-stick skillet as my go-to for more delicate fare like eggs. French steel pans can be taken directly from stove top to oven, making them an excellent tool for meat. Cast iron skillets perform these same tasks and very well, but I must say, I admire the lighter weight of the carbon steel over the heavier cast iron. With that said, let’s pan sear some steaks. Heat a French Steel pan over medium high heat. When the pan is hot, add clarified butter or oil. I like vegetable oil here. When the butter is melted and bubbles subside, or the oil is hot, carefully lay the steaks in the pan, sprinkle on a little salt and pepper and let them sear until you have a nice brown crust on each side. About three minutes per side. It’s ok to turn the steak several times, or let it sit undisturbed on each side until browned. Your preference. I prefer to use tongs to turn a pan seared steaks. That’s even though I’ve read a fork really won’t drain all the juice and flavor out of a steak. Transfer the pan to the oven pre-heated to 400 degrees. This is where the second most important tool comes into play to finish these steaks. That’s a good digital instant read meat thermometer. Don’t depend on a unit of time for finishing the steak. All steaks are not the same thickness. Using a probe thermometer to test the steak’s inner temperature. Cook steaks to a temperature of 120 degrees for rare, and 125 – 130 for medium rare. 140 degrees for medium. Check the temperature every few minutes. I have several and use each for different tasks. 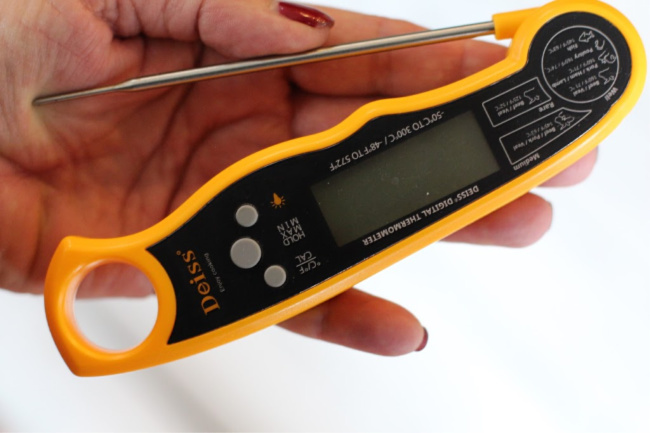 I find my Deiss Pro to work best for quick temperature checks for recipes like this pan-seared filet mignon. It’s got a large handle, easy to maneuver when fishing inside the oven, it’s easy to use, easy to read, and best of all, it’s got a long probe which leaves me less nervous about burning myself. It also works great on both small and large pieces of meat. Deiss has provided me several of their cooking tools, free of charge. They are high quality gadgets that I use nearly every day. My opinions are my own, I highly recommend their products. As did Best Reviews guide, placing it in the top 10. 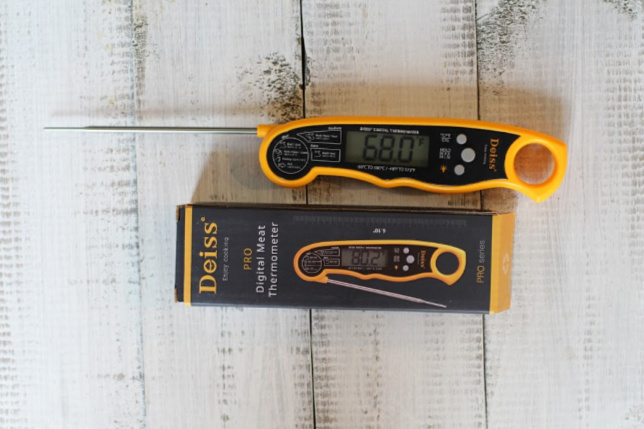 Give Away: Deiss has generously offered to send one of my readers a Digital Meat Thermometer for free. To enter, please leave a comment to this post indicating you’d like to win the thermometer. Winner will be chosen randomly. End date for the contest is November 7, 2018. We absolutely loved, loved, loved this combination of flavors. 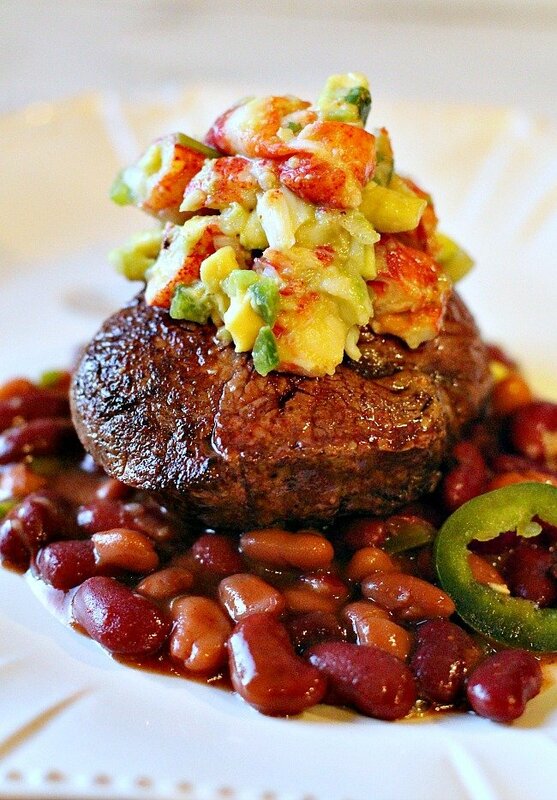 The slightly spicy bite of steak with the creamy decadent lobster salsa is absolutely divine. And what a beautiful surprise to serve the steak over richly flavored beans. I used my recipe for Bolita Beans with Red Wine. But you can make it easier by just opening a can of beans. There are many brands available that offer seasoned options. I did not purchase a whole lobster or lobster tail for this recipe, but found lobster meat packaged in the fresh seafood section at Whole Foods. It was a perfect amount for two servings of salsa for this recipe. This recipe comes compliments of Elway’s. A very popular, very highly regarded steak house here in Colorado. I hope you give this pan seared filet mignon recipe a try. And if you do, please come back and let me know how you liked it and give the recipe a star rating. Your feedback is valuable to me for developing future recipes. And if you have a favorite filet mignon recipe, let me know, I’d love to give it a try. 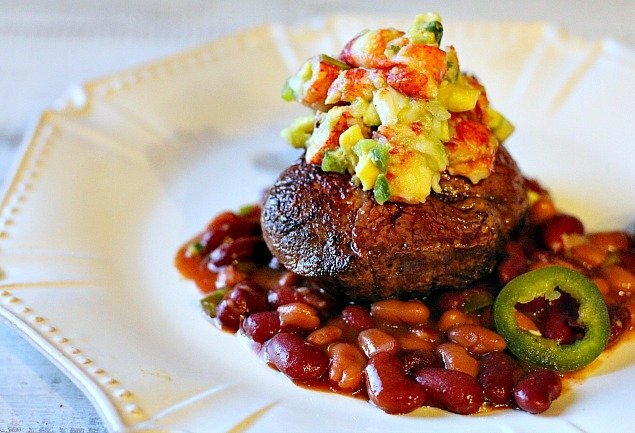 Pan-seared Filet Mignon topped with a luscious Lobster Salsa. Could there be a more perfect steak recipe for that special occasion dinner? Pan-seared and finished in the oven, this is an easy recipe for cooking filet mignon. Marinade steaks in a mixing bowl with 1 ounce oil, New Mexico Chile Powder and pepper. Mix together, turning steaks to coat and leave at room temperature for 1 hour before cooking. To make salsa, in a mixing bowl, combine lobster meat, avocado, green onions, jalapeno and lime juice. Season with salt and pepper and gently combine. Adjust seasonings. Heat a French steel pan ( or cast iron skillet ) over medium high heat. When the pan is hot, add clarified butter or oil. I prefer vegetable oil. When the oil is hot, carefully lay the steaks in the butter. Sear until you have a nice brown crust on each side. About 2 minutes per side. Transfer the pan to a pre-heated 400 degree oven. Using a probe thermometer to test the steak's inner temperature, cook steaks to a temperature of 120 degrees for rare, and 125 - 130 for medium rare. To serve: Place equal amounts of beans on plate. Arrange steaks on top. Place a dollop of salsa of steaks. Sprinkle the salsa with a pinch of New Mexico Red Chile Powder and serve. I prefer vegetable oil for pan searing steaks. It's more predictable. Clarified butter is a very popular oil to use. It adds a butter flavor and it great to use for basting the steak while pan searing. Be careful, it can burn - it's a little more finicky. Clarified butter can be made at home or purchased at the grocery store. Steaks can also be grilled. To quickly season canned beans: In a sauce pan, empty beans. Add 1/4 teaspoon each of garlic powder, New Mexico or Ancho chile powder, cumin, Mexican oregano. Add salt and pepper to taste. Heat through and adjust seasonings to your liking. This is a recipe inspired by Elway's Restaurant in Denver. I’m sharing this recipe over at Meal Plan Monday – Check it out. I am a member of the Amazon Affiliate partnership. If you order one of these products, I receive a small commission from your purchase, but at absolutely no additional cost to you. Love your blog. You make it seem so simple to prepare fabulous food. My steaks come out blue or well done. I would love to win the thermometer and see if I can save the steaks (and all the other proteins). YUM! Another winner, Lee Ann – can’t wait to try this! Please enter me in the drawing for this wonderful thermometer. This recipe hits all cylinders and I’ll have bubble-thoughts of it all day. And YES, I would absolutely love to WIN A THERMOMETER. I need one badly, every other one I’ve owned has failed miserably. Thank you for offering! Talk about a special steak dinner…that sounds over the top good. Count me in as one of the many who would like to win the thermometer. I would like to win the thermometer. I would love that thermometer, plus I am the son of a long time friend…….. Just saying. Would love to have a digital thermometer. I don’t cook a lot of meat, but when you need one, you NEED one. Looks so yummy! I would love to have a digital thermometer! Pick me?? Looks delicious and beautiful as always! I want to win. ? Thanks for the lesson on how to cook the steaks – looks & sounds delicious! Can’t wait to try it for a retirement celebration! ? I will however, have to use my trusty cast iron skillet. And, I would love to win the thermometer! Thanks Lea Ann! I would like to win the instant read thermometer. I have lost a great deal of my sight due to Leukemia and love to cook but I need help with reading the temps. Would love to win the pen.